Yaode has over 20 years’ consulting experience in the water industry and is a leading water treatment specialist. After completing his PhD from the University of Manchester (UK) in 1990, he pursued six years’ postdoctoral research in the Netherlands (University of Utrecht) and Switzerland (ETH-Zurich). Since moving to Australia in 1995, Yaode has worked both in academia and industry. He was a Senior Researcher in a specialist wastewater treatment company in the Hunter Region and the Research Manager for the Flocculation Group in the Centre for Multiphase Processes at the University of Newcastle. 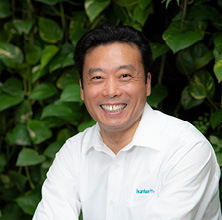 Yaode joined Hunter H2O (formerly Hunter Water Australia) in 2002. He presides over R&D in the Process and Operations Group and conducts specialist consultancy in water treatment process design, optimisation and trouble shooting. Yaode’s skillset is unique in the Australian water industry. He is an excellent candidate for solving complex water quality issues and finding suitable treatment solutions. Yaode is a leading expert in organics treatment, disinfection strategy and by-products management and control. Yaode has extensive experience in finding innovative solutions and attracting research funding from nationally and internationally competitive funding schemes. Examples include: the nationally competitive Australian Research Council funded Ozone/BAC linkage project with the University of Newcastle; and Innovative Sludge Dewatering Technologies for Municipal Wastewater project (an internationally competitive WERF funded project conducted in conjunction with CSIRO and the University of Newcastle). Yaode was the Project Manager and principal industry researcher on both projects. Yaode has published extensively in the field of water and wastewater treatment. He is an experienced public speaker and has presented research findings at national and international conferences. Yaode has also successfully supervised university PhD candidates and mentored honours students and younger process engineers.